Artist Elizabeth Terhune: Quite honestly, this poem initially felt like it was “too much” for me to handle emotionally—I held off. It brought to mind the many injured soldiers and civilians from the Iraq war and the countless other victims of other wars. I also have a friend, my piano teacher, who has had a prosthetic leg since he was nine due, I believe, to an accident caused by a drunk driver. Because we meet regularly for lessons, and because he is our neighbor and lives down the hall, I’m perhaps more conscious of the adjustments and concerns he lives with. But this poem is a nugget of feeling and image and it stayed with me. I was particularly taken with its modesty and its quietness. It seemed to favor and respect a kind of anonymity, saying that life is deeply felt, but mostly privately so. Poet Joy Icayan: That the leg was placed on top of the hand, like the hand was reaching out to it. It made me view the prosthetic leg as something that is elusive even to the other person. In what sense did the poem first present itself as a collaboration with a visual medium? Did it come to you first as image? As an idea? Music? Narrative? Artist Elizabeth Terhune: Immediately I saw the rough shape of a leg, but I didn’t see the hand. I made the image of the leg using fingerprints and had it on my desk for a week or more, really quite a long while, looking at it. Perhaps I knew there had to be a hand. However, “illustration” as a focus, particularly when working with a poem, makes me uneasy. I was surprised when the hand showed up. Working late one night after coming home from a night-job shift, I used a brush and water to soften and fade the fingerprints (oddly, unconsciously it replicated the act of polishing described in the poem). I saw then where the hand should touch the leg, and the leg and hand became a structure like a tree. In my view, this reiterates, visually, a sentiment of the poem. A dynamic of love is this energy of transformation and its relationship with memory. If your poem were a type of bird, what would it be? Poet Joy Icayan: Where I live, they paint chicks and sell them. The multicolored chicks are a treat to little kids. (And then the chicks die soon after because of the paint). If the broadside collaboration were a bird, what would it be? Poet Joy Icayan: It would be something serene, maybe a quiet, seasonal bird. Artist Elizabeth Terhune: Perhaps a ruffed grouse. I’m thinking of the birds who feign a broken wing to draw off prey from their young. We’ve often encountered them hiking in the Adirondacks. They seem intense emotionally, are heroically vigilant, and obviously are incredibly vulnerable to everything in the forest—foxes, owls, coyotes, fishers, hawks. 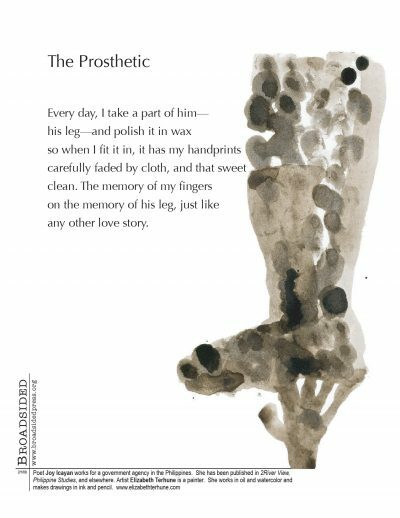 Poet Joy Icayan: The feeling of oneness of the hand and leg. They were done in the same color and same strokes that you can almost feel they’re part of the same entity. I was really pleased by this. Artist Elizabeth Terhune: My process surprised me. I created the image in two discrete sessions. Usually I go through many drafts over the course of days into weeks. Probably the same amount of time transpired between reading the poem and arriving at the final image, but what happened in between was different, less fretful. Poet Joy Icayan: I think, the conflict between detachment (prosthetic from the rest of the body) and connection (persona from the owner of the prosthetic). Artist Elizabeth Terhune: For this piece, shape. How could one not see a leg? Generally my work engages shape in relation to color to get into association. I’m interested in how visual art so easily conjures vast interior space, and why and how we then understand something. Poet Joy Icayan: I once wrote something on Van Gogh’s Sunflowers. I read somewhere that bees that have never seen real flowers before preferred the flowers in Gogh’s painting to other floral paintings. I am amazed at art’s capacity to do that—captivate human experience and even transcend it. If you had to represent your response to “The Prosthetic” in one word, what would it be? Poet Joy Icayan: The Lady The Monk by Pico Iyer. I want to be able to write like him, go places and fall in love with someone I can barely understand. Artist Elizabeth Terhune: For the past month or so I’ve been reading all of Jane Austen’s novels, and nothing else, straight through. PBS is presenting TV versions and I never want to relinquish my time and my right to imagine any novel. I’d never read Austen, and I have to say this is one strange experience. Absolutely marvelous, but overwhelming and I’m a bit undone. I way esteem her. Poet Joy Icayan: A friend’s photo exhibit. Her pictures were of chaos and movement, showing the daily lives of people in a blurry action. Artist Elizabeth Terhune: We had an embarrassment of riches again here in NYC this fall. The Seurat drawing show and the Puryear sculpture show at the MOMA and the Kara Walker show at the Whitney. Seurat’s drawings have long been important to me. It was wonderful to see many I’d not seen ever. Puryear’s work is lovely and so inspiring. Kara Walker’s video pieces, in particular, were stunning. I should also mention the show of Van Gogh’s letters at the Morgan. His sincerity in relation to his work is completely unmediated and quite moving. Poet Joy Icayan: Thank you for letting me be part of this experience. And a big thanks too to Elizabeth Terhune for her work. Poet Joy Icayan works as project assistant for a government agency. She lives and writes in the Philippines. She has a degree in psychology and does freelance writing and research for several companies. She has been published in 2River View, Philippine Studies, and elsewhere. Image: “Anonymous House,” 2007, 8.5″ x 6″, Bister ink on paper.